Have you wonder how do I make my Instagram videos? 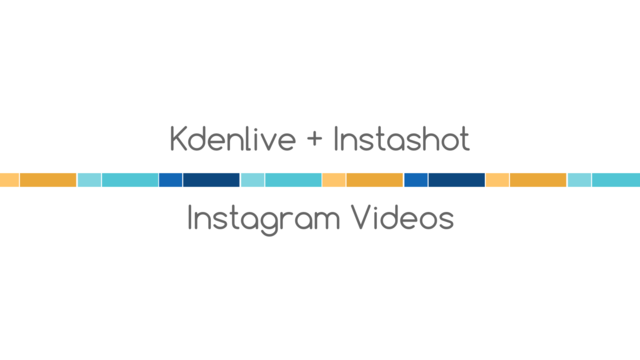 Work with Kdenlive is quite easy, and one of the things I like the most is that you can drag any video, image or audio and it will automatically load to the app. Build a video with Kdenlive is like organize a puzzle, you just need to drag the pieces that you already loaded and arrange them. You can separate tracks, cut them, add effects and much more. Step by step I will explain how to work with Kdenlive, but first, I wanted to show you the features of this app and make you fall in love with it as I have done. Once our video is exported as mp4, we load it to our phone, open Instashot and select our video. Browse until you find the video and load it to the app. At this point a group of options will show at the bottom, lets select Fit and if we want to cut our video as an instagram square, will select Full.. You can check the other options if you feel curious. When you’re happy with the fit, hit the Check Mark at the bottom right and on top, you will find the icon to load it to Instagram. It takes a bit of time since it lowers the quality, or at least that was my case, and once done will allow you to publish at Instagram. And that’s how I make the videos I like to share with you at instagram and that I “think” that lately have made you laugh a lot. Remember that your questions turn into podcast, so don’t be shy and leave a comment… ahh… and if you like my content, don’t forget to go to PortalProgramas and vote for tatica.org as Best OpenSource Blog, your vote means a lot to me! ¿Y tu canal de Instagram para seguirte cuál es?